On the one hand it's the ultimate in "de-development." But on the other it's a testament to Gazan ingenuity which has somehow been undimmed by three bloody weeks of war and two years of total economic blockade. Certainly there is no prouder home-owner in southern Gaza than Jihad al Shaer, as he sits on his palm-lined verandah looking out on his desert garden, its path neatly fenced with half buried tyres, and already blooming with water melon, tomatoes and aubergines. But it's the three-room family house itself which he completed within weeks of the end of Israel's Operation Cast Lead in January that is the source of his pride. It's built almost entirely with mud. Mr Al Shaer, 36, first became interested in the multi-millennium-old technique of building mud houses when he visited Bangladesh during a religious trip in the 1990s. "This was what our ancestors did before us," he says. "But I never thought I would be doing it myself." Last year, when his parental home, in a town whose chronic housing shortage is compounded by the relentless demolitions along the border with Egypt during nine years of conflict, became too overcrowded, he realised he needed somewhere else to live. 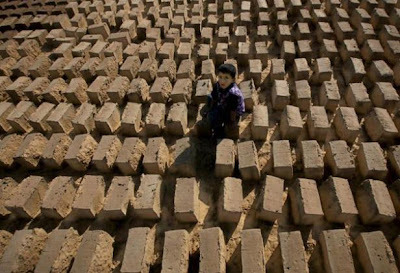 Money was in short supply and cement, which Israel has not allowed into Gaza since Hamas seized full control by force in June 2007, unaffordable. But thanks to the multiplication of smuggling tunnels under the border, mud was abundant. It was also free apart from the £32 a truckload it cost to transport it to his 300 square metres of land on what was, until 2005, the Israeli settlement of Morag. Using a shoe box to mould mud, sand and water bricks strengthened with corn husk straw, leaving them to dry for three days, and making a timber roof frame, allowed him to install his wife, his four daughters and infant son in a new house for around $3,000 (£1,877) compared with the $25,000 for conventional construction. Pausing only for the three weeks of war, when bombing made it too dangerous to make the four- kilometre journey from his home, he completed the job in just two months. Mr Al Shaer is delighted with his low-energy methods. "This is natural, not man-made," he says. "God has created this mud so people can live. There is no technology. This will be an alternative way for people to survive". But his financial incentive to go green also tells you something about how the siege of Gaza has been more effective in hurting the legitimate economy than Hamas, widely believed to be taking a cut from the tunnel economy. Experts from the Hamas de facto government have been to Mr Al Shaer's house to see whether it could be a model for the huge task of post-war reconstruction. That task – of which rebuilding the 4,000 multiple-occupied homes totally destroyed by Israel's military operation is only a part – has yet to begin because of the Israeli-imposed blockade on all building materials, even glass. But it may not be as easy as that. With a wife and seven children living in three storerooms, Mr Al Shaer's friend Nidal Eid is desperate to complete his own mud house, but he cannot afford increasingly scarce timber for the roof frame, which has now shot up from £192 last year to around £960. Mr Eid was inspired to follow Mr Al Shaer's example because he lived for 20 years in his parents' mud home in the coastal Sinai town of El Arish. Even though he had to skimp on straw because that has gone up to £4.80 a sack, he is convinced it will be sturdy enough to withstand rain and war. After all, he says "an F16 can destroy a house made of stone." For the blockade which has stopped his wood, "I have to blame the occupation [Israel]" But he adds: "And the Gaza government, because they are not making an agreement with the other factions. If there was a unity government, there would be no siege." Mr Eid says that he is now thinking of leaving Gaza if it becomes possible. "I want co-operation with Israel but Israel won't accept that," he says. "We just want to live like other people in the rest of the world." Mr al Shaer, agrees, arguing that his mud house is a symbol. "This shows we can live in a simple way," he says. "We are Palestinians, not terrorists or beggars. We don't need outside support, just open borders."